Tsunamis are disasters that threaten coasts and beaches all over the world. From observations of scientists and historical sources, we know today that tsunamis are a global phenomenon, they are possible in all of the world's oceans and seas, including the Mediterranean, the Atlantic, the Indian, the Pacific, and even in large lakes where they can be caused by landslides. Frequency and pattern of tsunami generation appears to be linked to the cycle of each region of the world and the pattern and range of small to large destructive tsunami events. Tsunamis can only occur in coastal regions and islands are the main targets. However, even if mostly beaches and coastlines are affected by tsunamis, the wave front can advance in estuaries many miles inland. 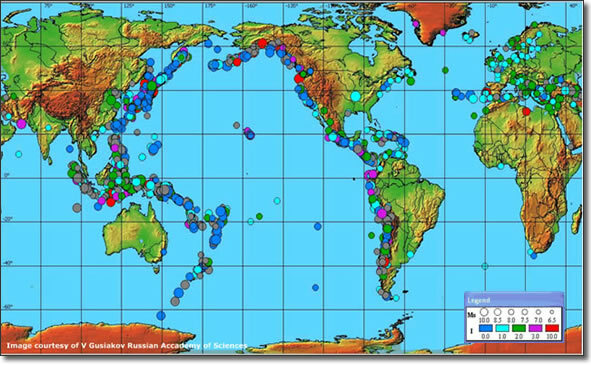 The map above shows the 2,000+ tsunami events that hit the countries located around the "Ring of fire" in know history (since year 1600 BC). 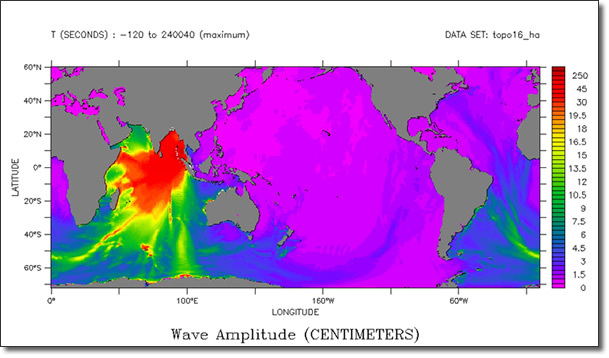 The map shows the tsunami location, intensity and size. The color of the circle shows the tsunami intensity and a larger circle indicates a greater event. It's interesting to note that tectonic plates boundaries have generated the most tsunamis. Earthquakes of at least 7 on the Richter scale generate tsunamis. Tsunamis are more frequent than what the general public think; for example, Japan is hit at least once a year by a tsunami. Around four-fifths of all tsunamis occur in the Pacific Ocean, particularly in countries which border the "Pacific Ring of Fire". One end of this region of high seismic and volcanic activity begins at New Zealand, heading northwest to Indonesia (completely by-passing Australia) and then west to Papua New Guinea and Indonesia, northeast along the Asian coastline, east to North America and then south along the western North American coastline. Roughly horse-shoe shaped, the Ring of Fire extends about 40,000km long and tsunamis can be generated anywhere along this rim. Many tsunamis have also been generated in the seas which border the Pacific Ocean. Shallow earthquakes generate tsunamis around the Pacific but tropical Pacific regions' tend to be smaller in size. Local devastation may occur but these tsunamis rapidly lose energy and are usually not destructive over larger distances of hundreds of kilometers from their source. The North Pacific and Pacific coast of South America in contrast generate larger earthquake events resulting in tsunamis that can sweep the entire Pacific and set the ocean in motion for days. This can occur up to half a dozen times a century on average. From the map above, one can see that large destructive tsunamis are rather rare. 13 of these were recorded over a time span of 115 years from 1849 throughout 1964. Scientists agree that about ten major tsunamis occur every century. Basing on historical data, about 76% of the world's major tsunamis have occurred in the Pacific Ocean and its marginal seas, 10% in the Mediterranean Sea, 11% in the Atlantic Ocean, and 3% in the Indian Ocean. In less active geological oceans like the Atlantic, Indian or Mediterranean oceans tsunamis can cause significant damage and death toll. In Regions that are densely populated tsunamis potentially endanger millions of people especially in vacation areas which are predominantly close to the ocean. Because of the prevalence of tsunamis in the Pacific, for example, the danger of a tsunami event is often underestimated in these less geological active areas. In the Mediterranean tsunamis occur less than in the Pacific Ocean but the devastating results must not be underestimated! Looking back to the year 1755 one can see that the tsunami triggered by the earthquake of Lisbon is accountable for the majority of the 70,000 deaths in Portugal, Spain and Morocco. Subduction zones exist in both the Caribbean and Mediterranean seas and there is a history of local destruction from tsunamis. The Atlantic and Indian oceans have fewer tsunamis with no subduction zones at the edges of plate boundaries to generate tsunamis except under the Caribbean and Scotia arcs. The Indo-Australian plate is subducted at it's eastern margin under the Eurasian plate. Tsunamis generated here are spawned towards southwest Java and Sumatra and usually not towards the Indian ocean. Scientific measurement of local earthquakes began in 1900 and most tsunamis since then have been generated in New Guinea, The Solomon Islands, Japan, Peru and Chile. Tsunamis affecting the whole Pacific basin come from the Aleutian Islands, the Gulf of Alaska, the Kamchatka Peninsula, and the South American Coast. At the centre of the Pacific Basin, Hawaii, has experienced tsunamis generated from the entire Pacific region. A Chilean tsunami of 1960 caused destruction throughout the Pacific region. Approximately 2,000 people were killed, of which 70% in Chile. It's surprising that, thousand of kilometers away from the epicenter, Samoa, Hawaii, and Easter Islands all recorded runups over 4 meters; 61 people were killed in Hawaii and 200 in Japan. 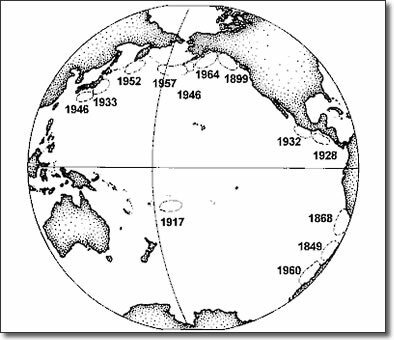 In 1868 a tsunami from northern Chile caused extensive damage in New Zealand, Hawaii, Samoa and the Austral Islands. Not as destructive or frequent, tsunamis have been generated in the Atlantic, Indian Ocean, the Mediterranean and smaller water bodies like The Sea of Marmara in Turkey. On the Anatolian Fault Zone in 1999 an earthquake generated a local tsunami which damaged the bay of Izmir. It is difficult to calculate the average number of tsunamis because of gaps in the ability to detect and record these events. The latter decade of the past century has seen tsunami events causing great damage to life and property in Indonesia (1992, 1994, 1996), Peru (1996), Japan (1993), Turkey (1999), Vanuatu (1999), Nicaragua (1992), Mexico (1995), Philippines (1994), Papua-New Guinea (1998). In 2004 the tsunami in the Indian Ocean caused enormous devastation throughout the Indian Ocean regions killing 230,000 people. Sumatra has had a long history of earthquakes and tsunamis in varying magnitude. Japan, with its long history of tsunami events, was hit by the most devastating event in 2011 resulting in widespread death and destruction to property and infrastructure. The economy downturn was even overshadowed by the radio-active contamination resulting from the damage to the Fukushima's nuclear reactors in the Miagi province. Why some Tsunamis are more devastating than others? The earthquake of December 26, 2004 in Sumatra and Andaman Islands was so devastating because the area was struck by a shallow powerful earthquake at its maximum force, an outstanding 9.0 magnitude. Sea-quake magnitude, depth, proximity to populated areas and shoreline shape are the most important variables to determine the destructive potential of a tsunami. As you see in the image below, the region affected by the Sumatran tsunami was huge although some areas were hit less harder than others. The population of the most devastated areas lived perilously close to the ocean as their regions had never experienced hurricanes or strong tides; at the same time, their boats were not seaworthy in tropical cyclones. Studies have shown that tides, hurricanes and cyclones are able to shape the shoreline to make it more resistant to tsunamis and reduce damage. The shoreline is eroded to a point by tides and waves so that they give the shoreline a protective profile against tsunamis. The runup on such coasts is greatly reduced. This was not the case in Banda Aceh, Sumatra, where the tsunami Run-up inland caused large inundation. This region on the northern tip of Sumatra was densely populated and 170,000 people lost their lives or were missing and more than 500,000 people lost their homes. That is also the reason why the March 2011 tsunami in Japan caused predictably much damage where the coast never experienced substantial tides nor storms.